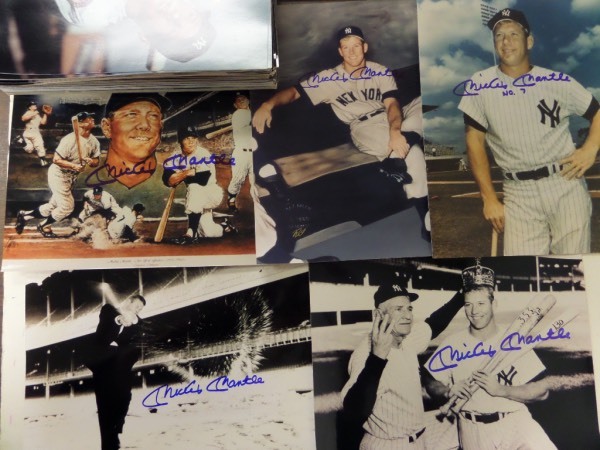 Coach's Corner - (100+) Mickey Mantle hand signed 8x10's! Go Back to Lot List (100+) Mickey Mantle hand signed 8x10's! Okay, dealer's, time to start drooling. This super sky high money-making chance is more than ONE HUNDRED 8x10 color and black and white photos and prints, with each and every one bearing the signature of the man pictured, Yankees HOF great, Mickey Mantle! Lots of different shots here, and with each able to retail into the hundreds by itself, you could literally turn this grouping into a small mint!